We know just how much brides and grooms are loving including DIY elements to their Wedding Day. And lets just be honest here, doing somethings yourself--if done right--can save you a good chunk of change while personalizing your Wedding Day at the same time! Who doesn’t love that idea?! Just look at how much Pinterest is exploding on so many fronts, but in particular when it comes to DIY-ing, Weddings, and well, DIY-ing your Wedding! ;) So after a fantastic HWC Bride brought up they would be DIY-ing their bouts we decided to put together a little tutorial on how to make a boutonniere on your own. We hope you enjoy! QUICK FIX: In case you are in emergency need of a boutonniere last minute, and you may not have all the supplies above. We in the past have made bouts skipping step three, and using double stick tape for step four. So keep in mind if you are in a situation where maybe you forgot about the ring bearer, you always have this quick fix option! Our recommendations: If you do decide to do DIY flowers we say to keep it simple. It can become very overwhelming. It is A LOT of work (I really cannot stress that enough) especially just before your wedding day! Think about choosing one or two flower types instead of many. Keeping it simple like this will help ease the stress of making your arrangements look perfect. Make sure you do a few trial runs to get an idea of how you want them to look. Also be sure to do this before you decide to take this project on yourself, so you have enough time to consider alternatives if they don't turn out the way you'd like. Take pictures of exactly what you would like if your family will be assisting. This way you can avoid having to oversee the entire set-up process. Make sure to count how many stems you will need for each type of arrangement, so you just enough and not to many or not enough flowers. Think about putting everything together the day before instead of the day of. If you have an area to store your arrangements properly. Also, get a few price quotes before making any final decisions. You may just be able to get what you want for your budget. And make sure you share your budget with who you get quotes with so they know where to start! 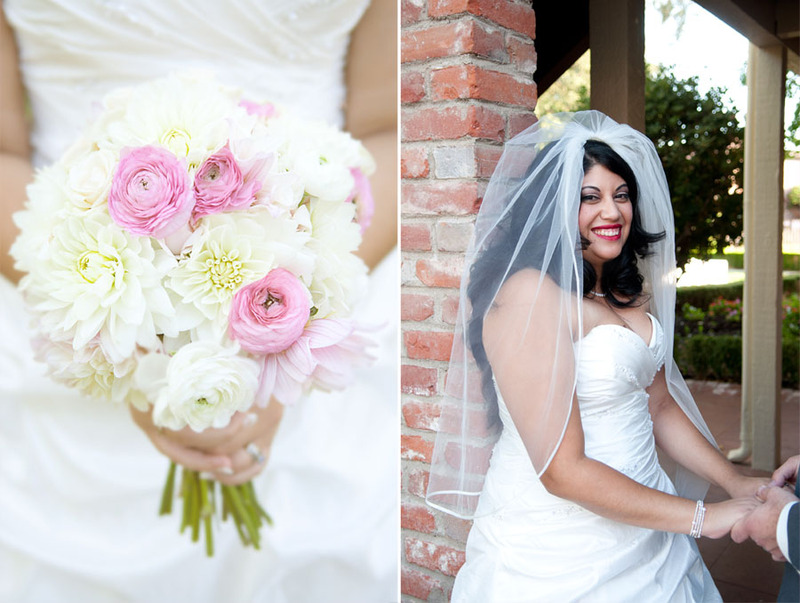 Think about having a florist do your bouquets, bouts, and corsages then do the rest of your flowers yourself. These items do take a lot of skill to put together something amazing if you want a bouquet with a lot of variety (not that some of our DIY bouquets weren't amazing)! Our number one recommendation is if you decide to put a lot of DIY aspects into your Wedding Day would be to hire a Wedding Coordinator (I know I know), but they can oversee that every little detail is done exactly how you want! I seem to take many many trips to random places in my home town, collecting very random things for these fun blog posts. Especially when I have a burst of creative ideas! I blame most of my trips to recycle town on my husband, where I found the window! He always wants to go and find thing for his projects. Thus, making me come a long and find random things for my projects ;)! ALL HIS FAULT. RIGHT?! The things I find at recycle town are usually pretty crusty. But occasionally I find some amazing gems, like this one. As soon as I saw this old window I thought, "what the heck can I do with that?!" And then I came up with a fun bar menu you will see below. It was very simple. I found the window as is, although I did have to clean off some cob webs and such. I purchased paint pens from my local Michael's (I purchased the Craft Smart Paint Pens). I planned out what would be included on the bar menu (all my personal favorites!). Then spent some time choosing a font I thought was fitting for the style of the piece. Along with exactly how I wanted the lay out to look, and viola! Here we have it. A simple, easy, and unique bar menu for your Wedding or Rehearsal Day decor. Now obviously you will include the drinks you will be serving at your event! Signature drinks are growing and growing in popularity! Your guests will love it, it ads character to a Wedding Day! And its a great way to keep your bar budget in check! Just make sure that what ever drink you choose is easy and quick to make more of, for when your guests gobble it all up and the bartender needs to mix up some more! Come up with a cute name for your drink. Something that represents you as a couple, things you love, etc. And funny is always a hit :)! And keep updated on our future blog posts! 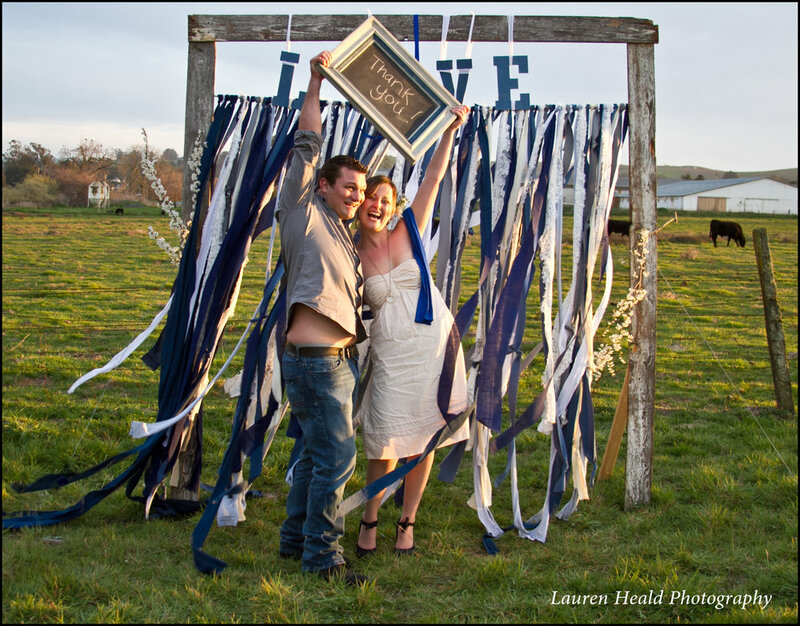 Or check out some of our past posts here: http://healdweddings.wordpress.com/ Like how to make a Vintage Chalkboard! -First, watch our video (http://vimeo.com/36181068) and if you can, pass it on to a few of the more responsible groomsmen, or whom ever may be assisting with your flowers. It will also be a good idea to put a print out of the basics of pinning with the boutonnieres for the day of. Also, be sure to have a list of names or put a name on each boutonniere for reference. You would be surprised how traumatizing it is to give a ring bearer a boutonniere that was not intended for him, then have to makeshift one because the poor kid is DEVASTATED after you took it away from him to give to the proper person. What a let down! -Line up the boutonniere with the angle of the lapel, hold securely in your non-dominant hand. -Flip the lapel over and slide one pin in through the bottom of the stem. While inserting the pin try to line it up to stay within the stem of the boutonniere, however the pin does not have to go all the way into the stem. -Do a small check of the front of the lapel to make sure your boutonniere is still lined up and the needle is not protruding, then flip it back over and check to be sure it is not protruding on the back side as well. You will use another pin for the top to help secure it properly, inserting it as you did with the bottom pin. -Lay the lapel back down, do any adjusting if necessary, and voila! You have an ouch-less, secure, and straight boutonniere! Make sure you follow us for future blogs on how to make a boutonniere and using things other than flowers! 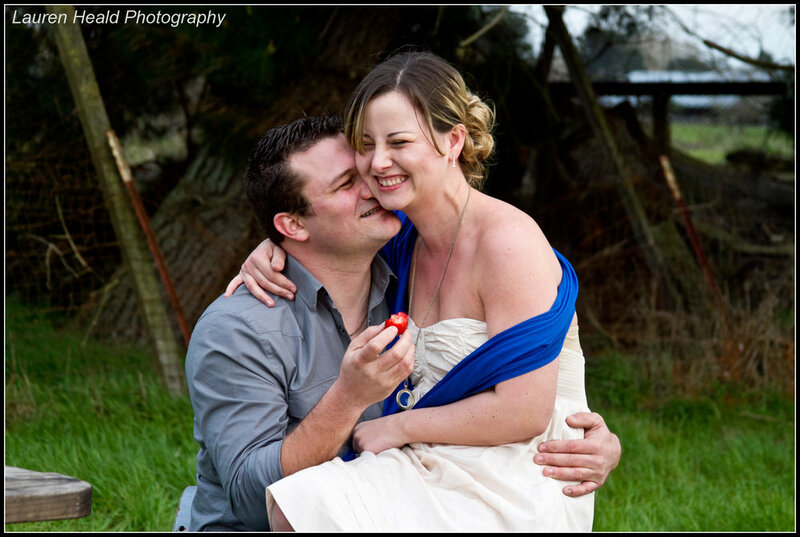 Photo's provided by the incredible Lauren Heald at Lauren Heald Photography; LaurenHeald@gmail.com, 707-483-2480! Nick and Sabrina Stone were married on March 10, 2012 in Las Vegas! Congratulations to you both! And thank you for letting me be involved in so many ways for your beautiful wedding! This photo shoot started out as just a fun way to express all these ideas that kept building up in my mind! A creative outlet I shall say. Since it isn't all to often that I get to design to my hearts desire, I was beyond excited to do this project! I was writing down tiny little ideas, thoughts, and design concepts for MONTHS before this shoot came together. And although not everything came together quite as I expected. I am beyond amazed and thrilled at how it came out! I love every small aspect of it. Nick and Sabrina were the perfect couple to bring in for this shoot! They're love and passion for each-other shows in every picture of them! They were high school sweet hearts and after years of being apart from each-other and many challenges in their lives, they found themselves back with each-other, and happier then they had ever been before! I had the pleasure of being right beside them on their wedding day after this photo shoot. All they're love truly emanates from every bit of them, every time I am around them! They absolutely love to travel, which explains their MONTH long honeymoon all over Europe (jealous? I know I am!). It was absolutely freezing out on this Sunday at a private residence in Petaluma, CA. Nick, Sabrina and all the fabulous people involved were such troopers. Melissa's beau who hung out to help even made us hot chocolate somehow from his truck (great asset to have right?!)! So let's get on to the good part! I was lucky enough to put together an amazing group of people for this shoot. Their work really speaks for itself! Thank you all for all your amazing hard work! None of this would be possible without you! Special, special thanks to our new addition here at HWC Melissa Medeiros for your amazing recommendations and assistance in guiding this shoot to completion! Oh and your running around like a crazy lady to help me get it all completed ;)! Follow us on Facebook or Twitter to keep updated on our "how to's" on all these special items we put together for this and future shoots!